Momo Hime comes from a background of theater, dance and photography. She got her first taste of conventions as a small child, when her mother took her to Star Trek cons. She even won several costume contests - including once with a Ferengi trying to sell the 8-year-old Momo to the audience! Thanks to her aunt's influence, she began helping in the costuming department at her local theater in middle school. 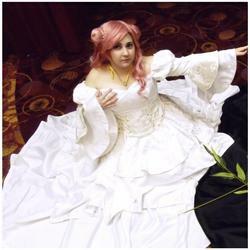 Fast forward to 2008, and Momo attended her first con as an adult - Naka-Kon, where she dressed as Aerith Gainsborough. She's never looked back, attending numerous conventions and participating cosplay contests throughout the US, honing her skills and making great friends along the way.